Four years ago my hair was fire-engine red. Or maybe it was pink-purple, I don’t remember exactly; I went through a phase of dying my hair colors that cannot be found in nature and now they blur together. I was living in the suburbs and only ventured into Boston on Wednesday nights, when my friends and I would take the train to Davis Square, and I was most definitely not “into” food. 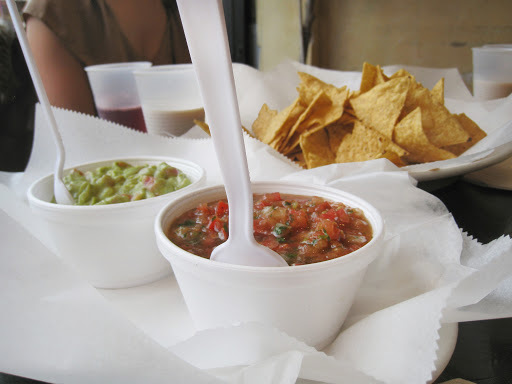 But one night we found ourselves in Anna’s Taqueria and a friend offered me some guacamole and chips…and what happened next would foreshadow my eventual fate as a foodie. My mother often served homemade guacamole with chips at home when we had guests. I had decided in my infinite childhood wisdom that I disliked guacamole, probably feeling suspicious of green foods, so I always avoided it. I don’t know why I tried my friend’s order on that particular Wednesday night. Maybe my colored hair was making me feel brave. But Anna’s was so good that it totally converted me to the dish. I went home and tried my mother’s for the first time, and loved it. Thereafter I always ate more than anyone else, always first putting the chips in the microwave to imitate the warm chips/cold guacamole temperature contrast I had experienced at Anna’s. Anna’s Taqueria, Davis Square location. Fast forward to present day. I started a food blog and moved to the city for college, and I knew that eventually I wanted to write about this pre-foodie memory. So imagine my elation when I was invited to lunch at Anna’s to review their current menu! Mike Kamio opened the first of six Anna’s Taqueria locations in 1995. His motto for the restaurant was “You’re only as good as your last burrito,” and one of the restaurant’s founding principles is a commitment to fresh, local ingredients. This makes me especially happy, coming from a college that has zero transparency about where it sources the ingredients of the food in its meal halls. In sharp contrast, I know that Anna’s sources its tortillas from Harbar, its meats from Mayflower Poultry & Sneider Meats, and its oils and rice from Ghee Chinese Trading Company. Fresh and local! Anna’s isn’t just transparent about it’s sourcing, it’s proud of it. I arrived for lunch at Anna’s Davis Square location on a dreary November day, optimistic that some yummy food would distract from the fact that we hadn’t seen two consecutive days of sunshine in Boston for several weeks. We kicked off our meal with those handmade guacamole and chips that were just as delicious as I had remembered, now with salsa too! I wanted to eat moremoremore but I restrained myself, knowing that other treats would soon be arriving. Anna’s Taqueria tortilla chips with guacamole and salsa. Our first main course was tacos al pastor. 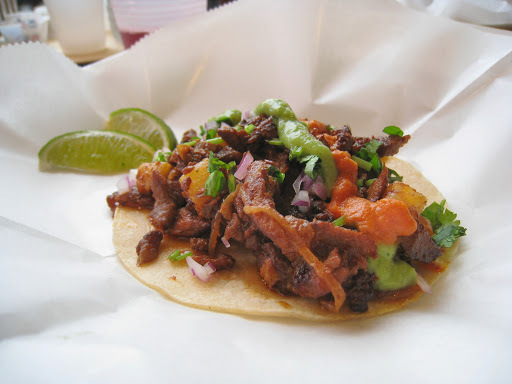 Mine consisted of a corn tortilla topped with shaved rotisserie-cooked pork, pineapple, red onion, and cilantro, then drizzled with guacamolio and a tomato-based sauce with Mexican-style spices. Anna’s Taqueria taco al pastor: a corn tortilla topped with shaved rotisserie-cooked pork, pineapple, red onion, cilantro, drizzled with guacamolio and a tomato-based sauce with Mexican-style spices. The pork was tender, and the spicy guacamolio kicked but not too hard. I especially loved the tiny chunks of pineapple, which added a tang of fruity sweetness to each bite. I liked everything we ate but this was my favorite course. The flavors just sang. We were served two Mexican drinks with our meal: jamaica and horchata. The jamaica is a tea brewed daily from fresh hibiscus petals, a floral and summery complement to the Mexican flavors. Apparently jamaica is often called a Mexican fruit punch, which seems fitting when you taste it. It’s bright and fruity without being aggressively sweet. Horchata is made fresh daily with rice milk, almonds, and cinnamon. Along with the jamaica, these are totally different beverage flavors than I’m accustomed to. I wondered how they would fit with my palette. I ended up loving both and ordering a refill on the horchata. Despite being dairy-free, horchata has a milky flavor that complements the food’s spicier notes perfectly. This definitely goes on my Must Order list. 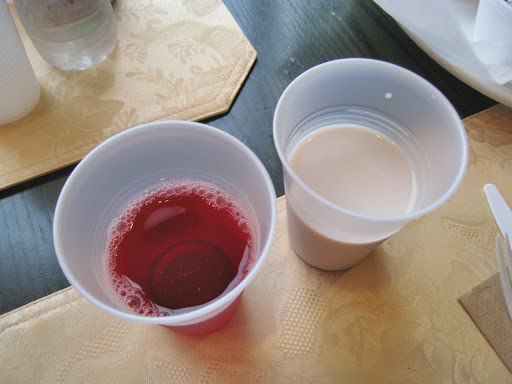 Anna’s Taqueria specialty drinks: jamaica (left) and horchata (right). Our next course was the “super” (12-inch tortilla) burrito with grilled chicken. This is one of Anna’s most popular sellers. In fact, the Improper Bostonian awarded Anna’s Taqueria “Best Burrito” every year from 1999 to 2012, at which point you would think they might get a jersey retired to the rafters in Boston Garden. Unsurprisingly, I quite liked it. Also unsurprisingly, my favorite bites were the ones with the most cheese. 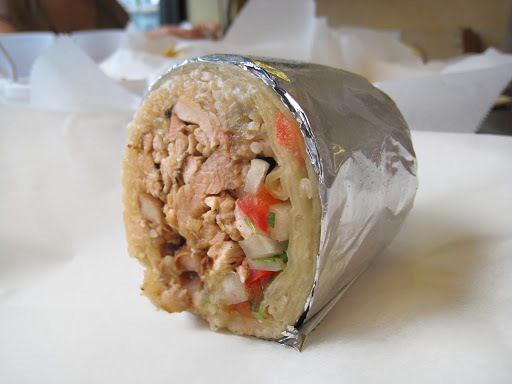 Anna’s Taqueria burrito with chicken. The menu at Anna’s is relatively customizable depending on your personal tastes. Nowadays I am comfortable ordering items “as advertised,” but back in my picky-eater days this would have been a necessity for me. A little more guac? A tad less cheese? Extra this but none of that? Your order is an open conversation with the staff. I like that. I dislike menus that say “No Substitutions,” and Anna’s is pretty much the opposite of that. What’s more, Anna’s is both vegetarian- and vegan-friendly with freshly-grilled seasonal vegetable options. They even have whole-wheat tortillas. We finished lunch with the quesadilla with carnitas (roast pork with traditional Mexican-style seasoning). Someone at the table remarked that this felt more like an indulgence than the burrito, and I agreed. The bottom was lightly crisped and it packed more cheese. Everything should always have more cheese. And with enough avocado that I could include some in every bite, I was momentarily forgetting about the dreary weather and my looming final exam. Anna’s Taqueria quesadilla with carnitas (roast pork with Mexican-style seasonings). Anna’s Taqueria also offers imported Mexican Coca-Cola. This is Big News. 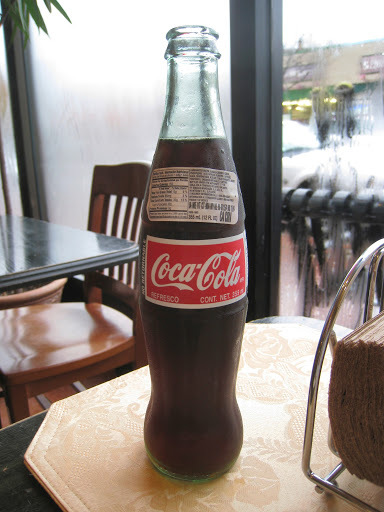 Mexican Coke differs from American Coke in that it is made with real cane sugar instead of the high-fructose corn syrup. I have heard this lecture repeatedly from someone in my life who is addicted to Coke. Supposedly there are certain times of year where you can find Mexican Coke, and only certain places where you can buy it. I know the mythology, but I wondered if my taste buds would be able to detect the difference. Not only could I taste the difference, but I vastly preferred Mexican Coke. The flavor is less chemical-y and much cleaner. Mexican Coke at Anna’s Taqueria, made with real cane sugar. My lunch at Anna’s was free, but my opinions are my own. I dine out frequently, far more frequently than I write about here, and I am pretty choosy about which restaurants I choose to talk about on my blog. Busy as I am, I don’t take the time to write a post unless the meal was memorable and I believe other people will enjoy the food as much as I did. I didn’t accept the invitation to Anna’s to discover whether it was good. I accepted the invitation to Anna’s because I already knew it was. 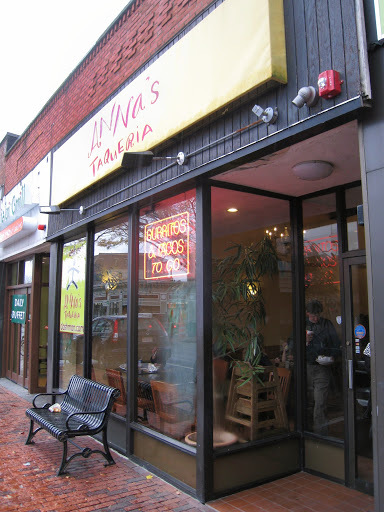 Anna’s Taqueria is an institution in Boston, especially among college and grad students. It is a popular option for quick, low-cost, high-quality food. And in a society where adults and career professionals are becoming increasingly concerned with how their food is prepared and where it comes from, you have to admire Anna’s for recognizing that this trend begins with us younger customers. Following that same logic, Anna’s operates a soy-diesel truck that runs on used vegetable oil and recycles at every Anna’s location (roughly 2,000 pounds per week). All their specialty drinks are served in biodegradable cups made from corn flour. You can label these “environmentally friendly business practices” or “corporate responsibility” or whatever, but the bottom line is that Anna’s is smart enough to recognize that customers care about these things. When I go to a restaurant, I like knowing that restaurant is trying to leave a small footprint. It makes me feel better about my decision, and if I feel better than I’m more like to come back. Of course, if I can’t make it to Anna’s then it’s worth noting they offer pick-up and delivery, too. Earlier in the semester I may not have paid attention to this, but during the blur of finals when hours spent studying makes the words on each page swim before your sleep-deprived eyes, I didn’t relish the idea of trudging to the meal hall for a mystery meal. If you can relate then I direct you to Anna’s Foodler page. Go order a batch of burritos and be a hero to your study group. But it’s not just students who love Anna’s Taqueria. Last week I sat around a table with a diverse gathering of people in Nashua, New Hampshire—including a librarian, a carpenter, a bow-tie salesman, a professor, and a law student—and during our conversation someone mentioned that he wanted to try Anna’s Taqueria, which immediately elicited a chorus of “WHADDAYA MEAN, YOU NEVER BEEN TO ANNA’S?!? !” It really is famous, and it’s famous because it really is that good. If you want quick, affordable, and quality food, Anna’s Taqueria should be at the top of your go-to list. 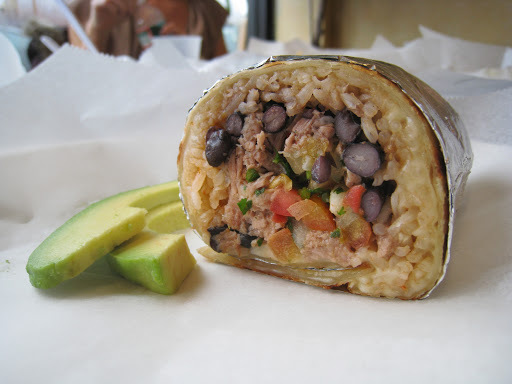 This is making me crave an Anna's burrito! Funny how a lot of us end up loving the foods we use to hate when we were younger. I've always loved avocados though!